Four years after a string of suicides brought unwanted attention to his company, Foxconn Technology Group's CEO said none of the deaths had to do with poor working conditions at its factories. 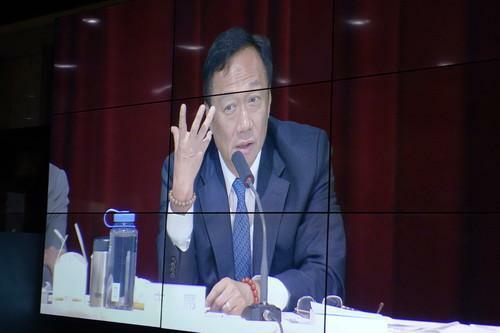 "It wasn't because the workers were tired," Terry Gou said on Wednesday at the company's annual shareholders' meeting. "Some of it was because the work is monotonous, but 90 percent of it had to do with personal relationships or because of family disputes." In 2010, over a dozen Foxconn workers made suicide attempts, resulting in 14 deaths, according to labor watchdog groups. The suicides brought heavy scrutiny to Foxconn over the working conditions at its factories in China, where it assembles products for Apple, Hewlett-Packard, Nintendo and other big brands. Since then, Foxconn claims to have made progress in improving life at the facilities. But even when the suicides occurred, the company's factories had some of the best working conditions in China, Gou maintained on Wednesday. Following the suicides, the Chinese government sent 230 officials to the facilities, spending two weeks to investigate the deaths, he said. "They originally wanted to publish the investigation results, but a minister I won't name said they couldn't," Gou said. "If they did, at least 95 percent of China's factories wouldn't have been able to reach the standard we met." The bad press from the suicides, however, hasn't stopped Foxconn from expanding. China and other countries including the U.S. are still asking the company to build factories in their markets, Gou said. "This [the suicides] is what happens when your company reaches a certain scale," he added. At the time, the factories in Shenzhen had 470,000 workers, more than the student bodies at typical U.S. or Chinese universities. Gou also cited a "news article" to claim that the leading cause of human death is the mosquito, followed by suicide, but neither appears on a World Health Organization list of the top 10 causes of death. Many of the workers at the factories were between 20 and 25 in age, had yet to marry and were away from their families. So breakups with a lover could be traumatic, and workers had no one to look for comfort, Gou said. Other factory workers then decided to exploit Foxconn, by making suicide attempts to gain cash, he added. "We at first gave a compensation that was so high, the families of the suicide victims' would never be able to spend it all," Gou said. Not all would agree with Gou's view of the events. Labor protection groups have in the past accused Foxconn factory managers of forcing workers to log long hours, and demanded the company raise wages. But some experts also argue that Foxconn factories are generally better run than the smaller, lesser-known manufacturing facilities in the country. Foxconn, however, is trying to rely less on human workers. On Wednesday, the company's CEO revealed Foxconn has a fully automated factory in operation in the Chinese city of Chengdu. "We haven't talked much about the factory, but it's manufacturing a product from a very famous company," Gou said, without elaborating. The factory can run for 24-hours with the lights off, he added. In addition, Foxconn has been adding 30,000 of its own industrial robots to its factories each year. "We don't sell them, because we don't have enough for our own use yet," he added.